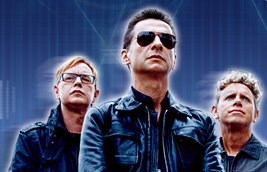 Os Depeche Mode vão actuar na ECHO 2009, entrega de prémios da musica alemã (Promoção de Sounds Of The Universe), onde fazem a apresentação exclusiva e mundial do novo single “Wrong”. Berlin, 3 February 2009 - Depeche Mode will be among the stage acts at the 18th ECHO German Music Awards at Berlin’s O2 World, where the legendary British band will perform an exclusive world premiere of “Wrong” - the first single off their 12th studio album “Sounds Of The Universe”, scheduled for release on 17 April. “Depeche Mode have been an important influence on pop music since the 1980s and keep providing exciting stimuli to this day, effortlessly and earnestly bridging the past and future of pop music,” explains Prof. Dieter Gorny, chairman of the German Music Industry Association. “We are greatly honoured by the fact that the band will perform the exclusive worldwide debut of the first single from their long-awaited new album at the ECHO awards.” The award show produced by MME will be presented by Barbara Schöneberger and Oliver Pocher. ARD (Germany’s Channel One) will broadcast the ECHO 2009 awards gala at 8:15pm on 21 February. Depeche Mode is one of the most influential bands of the past 30 years, with more than 100 million recordings sold worldwide. Since its inception, the group has always stayed true to its creative ideas and ideals – and its original formation. Since founding Depeche Mode in Basildon, England in 1980, Martin Gore, Dave Gahan and Andy Fletcher have won not only critical praise but also a huge fan base around the world. All eleven studio albums have reached the Top Ten worldwide. In addition, the band has a solid reputation as an outstanding live act. On their recent world tour alone, Depeche Mode played before 2.8 million people in 31 countries. Alongside Depeche Mode, the line-up of top international stars at the ECHO includes U2, Katy Perry, Udo Lindenberg, Silbermond, Amy MacDonald and many others. Tickets for the ECHO German Music Awards ceremony are still available online at www.o2world.de or by calling 01803-20 60 70 (€0.09/minute from a German landline; charges from mobile phones vary). In addition, tickets are available from the O2 World box office (Mondays to Fridays from 10:00 to 20:00, Saturdays from 10:00 to 14:00), and at www.eventim.de and all the usual ticket agencies.